Does rel="follow" work and pass on link juice from no-follow blogs? Lately it's been so cool... I've been dreaming in HTML sometimes, with God giving me dreams and tips about how to grow this writing business. I had a dream that getting link juice passed was as easy as typing out the code in HTML, with 16 backlinks all passed in one "a href" hyperlink and me specifying the 16 sites all in the hyperlink code. Would that it were that easy, but I know I'm getting clues to how to rise in Google's ranking. Another dream showed me automated code, which was a hint to keep pursuing various types of auto-posting and auto-blogging, even after the Google slap. But that I'll do cautiously, and not on domains that I really care about. Which "follow" codes work in the eyes of Google? This guy asked if a rel="follow" will affect the "nofollow" attribute, and the answer still seems up in the air and unanswered totally by Google. 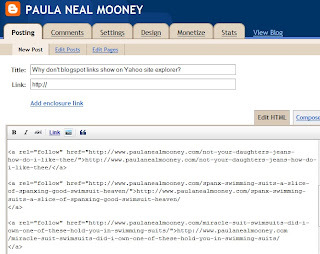 I've already changed the code of this blog, I believe, back to the "do follow" I had made it years ago (and then had changed it back to nofollow) but as you'll see from my previous post, I didn't see the backlinks coming back -- at least not as listed in the Yahoo site explorer. Okay, I do see blogspot links coming in from this blog under the "incoming links" field in my Wordpress dashboard, but it only gives a few, and not to the specific pages. We will keep testing and reporting the positive results.